Response envelope: Matching pearlescent A2 size (4-3/8x5-3/4) envelopes.70 lb paper. SOLD OUT. THANK YOU! ON SALE! 150 INVITATIONS LEFT. IVORY RIBBON ONLY. NEVER AVAILABLE AGAIN. Gloriously Vibrant Wedding Invitation - not for the shy... DIY Invitation with pearlescent handmade paper wrapper and lush ribbon. 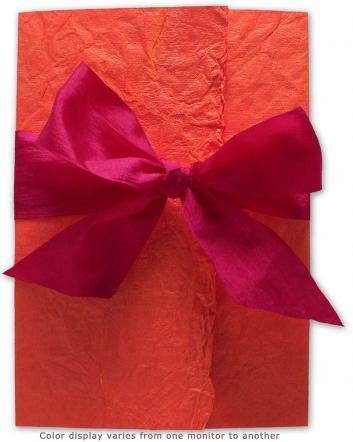 Elegant invitation wrapped in an orange-color, textured, pearlescent handmade rag-paper wrapper. Complex coloring: overtones of gold. Crinkled texture with one natural deckled edge. Wrapper is die-cut (ribbon slots) and scored for easy assembly and professional finish. Invitation card is a heavy pearl-white pearlescent Italian paper. Matching pearl-white pearlescent mailing envelope. Closes with a 1-1/2 inch Fuchsia Pink textured ribbon. Overall Size: 5-1/2" x 7-1/2" (A7 standard mailing envelope size) Envelope is a normal size but the thickness of the invitation may incur extra postage. Invitation:Heavy pearl-white Italian pearlescent cardstock (105 lbs). Wrapper:Handmade Indian rag crinkle paper with pearlescent finish and one natural deckled edge. We die-cut slots for the ribbon and score fold-marks into the wrapper for easy assembly. Envelope:Pearl-white Italian pearlescent 70 lbs. A7 size (5x7) envelope. Ribbon: One and one half inch, textured ribbon. We allocate enough ribbon to tie a bow or a knot. Extra paper:An extra 10% of the cardstock and envelopes are included for printing overage. Microsoft Word templates if you are printing your own.